Be the first to share your favorite memory, photo or story of Melanie . This memorial page is dedicated for family, friends and future generations to celebrate the life of their loved one. 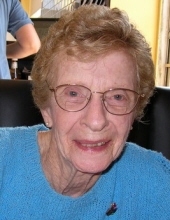 Peacefully passed away on Tuesday, January 29, 2019 at Wellesley Central Place, Toronto, in her 97th year. Predeceased by her husbands; Paul Duffy and Donald Willard. Dear mother of Mary Hickman of Toronto, and Tom Duffy and his wife Cindy Mitchell-Duffy of Burnaby, B.C. Cherished grandmother of Christine Hickman and Bradley Hickman of Toronto, Robyn Duffy of Burnaby, B.C, and great-grandmother of Emily and Luke Farrugia. Cremation has taken place. A Memorial Service will be held at KITCHING, STEEPE & LUDWIG FUNERAL HOME, 146 Mill St. N, Waterdown on Friday, March 22, 2019 at 12 noon. Reception to follow. Donations in Melanie’s memory may be made to St. James United Church, Waterdown. If you must bury something let it be my faults and my weaknesses. If you do all I have asked I will live forever. Always in our hearts and never forgotten by family and friends. "Email Address" would like to share the life celebration of Melanie Willard. Click on the "link" to go to share a favorite memory or leave a condolence message for the family.